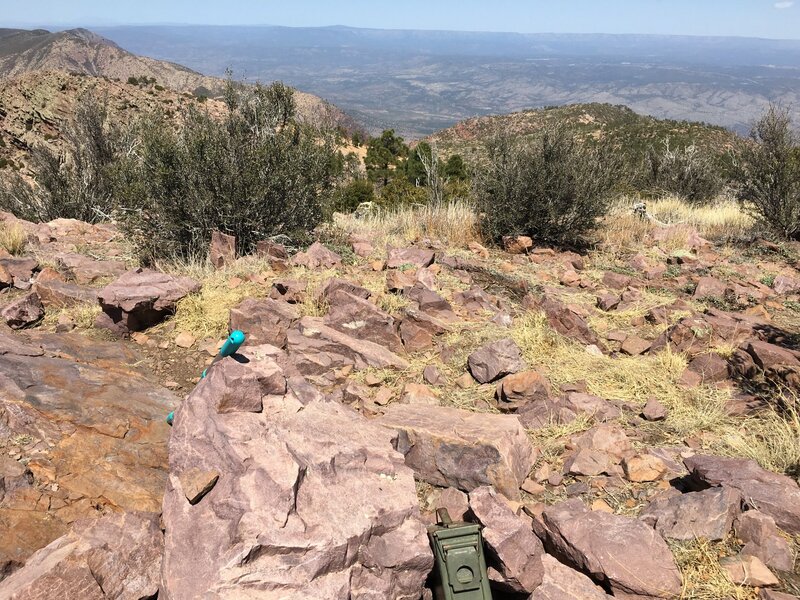 No comms sites on this peak, but Ord, Pinal, Towers, Greens, White Tank and many more sites were reachable on my FT-60. Handy in case of trouble. Holy quercus turbinella and manzanita, Batman! 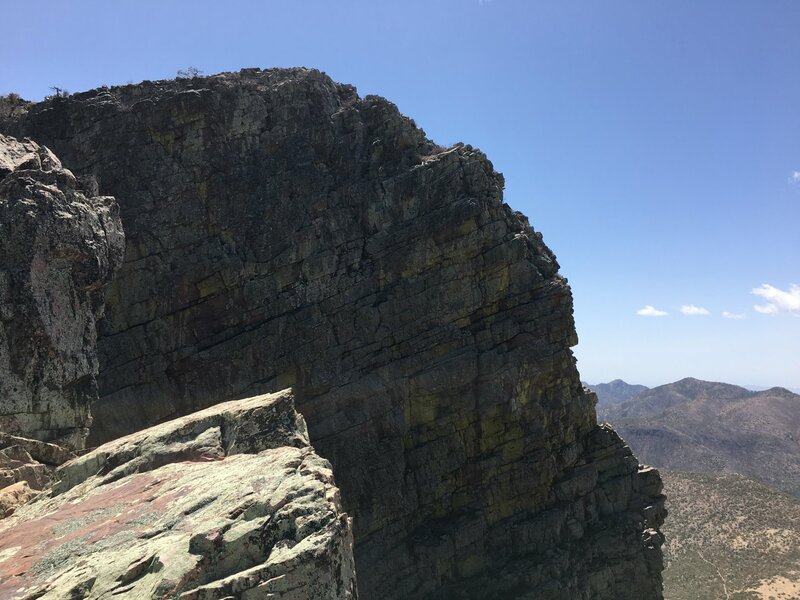 After reviewing my mashup of Arizona 2000′ Prominence and 25 Miles Isolation, and seeing the remaining southwestern Arizona peaks I was not going to get to this spring as it’s gotten too bloody hot already, it looked like Mazatzal Peak might be the next candidate. 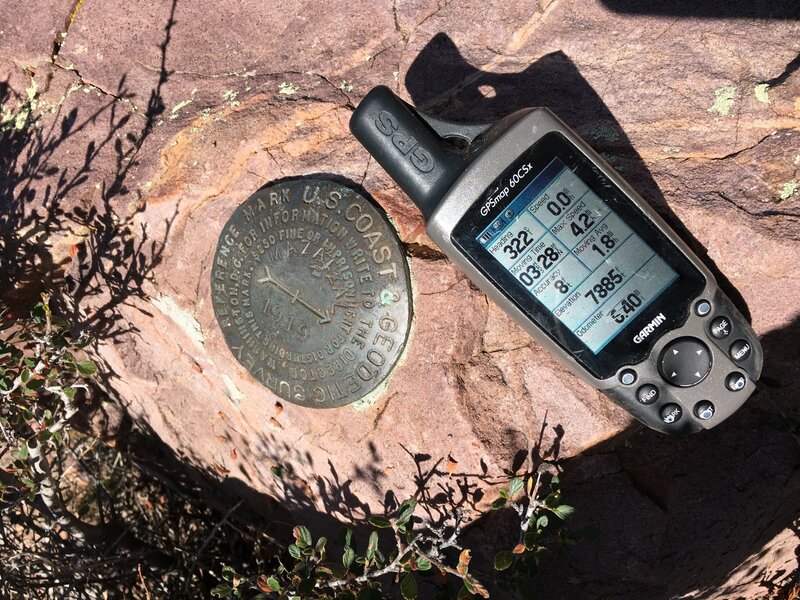 With a 4100′ trailhead only 75 miles from the house, this 7903′ peak was the next closest on my list. Friday the 6th I set the alarm for 0345, but somewhere before 0345 I must have deactivated the alarm so I awakened at 0700. Thought about it for a bit, and decided instead to not hike. Later on, I’d live to appreciate that decision. Saturday afternoon I again set the alarm for 0345, and I was up at 0345 Sunday morning, wondering if I really wanted to get out of bed. Nonetheless, by 0415 I had already collected the first of two supertankers of diet Mountain Dew at the local Circle K, and was headed east on Shea through Fountain Hills and then up AZ-87 to the Mazatzal Wilderness just west of Rye. I thought I’d carefully researched the challenge of the climb up Mazatzal; I read the postings of Casserly, Gaudet, Kassan, McCann, Nuernberger, Poulin, Rankine, and Sexauer. Some were pretty sparse with description. I downloaded into both the phone and the Garmin the GPS logs of Kassan, Poulin, Rankine and McEntee. It was especially good that McEntee had summited the peak only 4 days before me. Arrived at Barnhardt trailhead around 0620. Interestingly, it was partly cloudy, smelled humid, and the sun was hidden behind low clouds. The tops of the nearby peaks were shrouded. Temperature around 62° F. Dead calm. Watch the video to see how the weather changed over the day. My plan was to go in via the Barnhardt, climb the broad ridge followed by Rankine and McEntee, and then decide which way to come down. 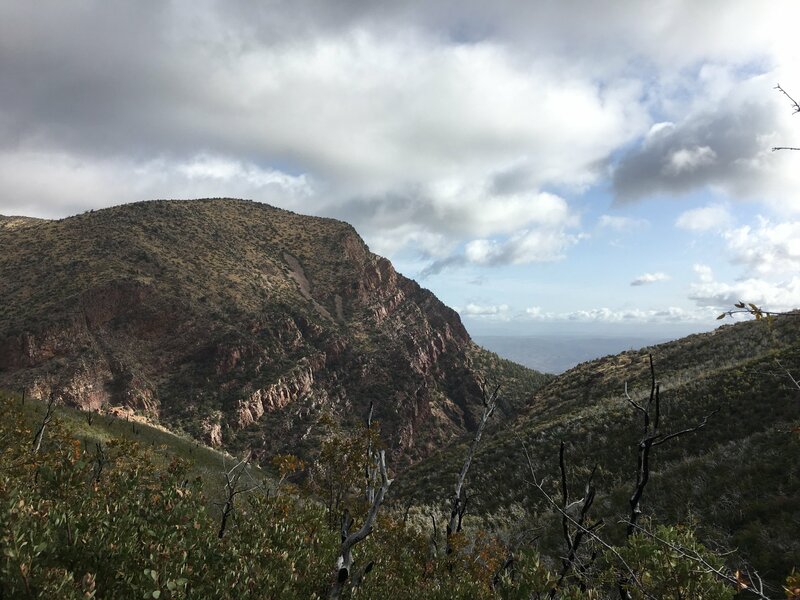 I had Kassan’s ascent route in the GPS, but I’d be following it backward, and he’d mentioned a severe lack of cairns on the cliff section. On trail at 0634, 28 minutes after sunrise. Barnhardt trail wilderness boundary marker. The Barnhardt was a cakewalk, relatively speaking. Good footing, generally easy grade, and I was in the shadows until the combination of sun position and a break in clouds at 0740. 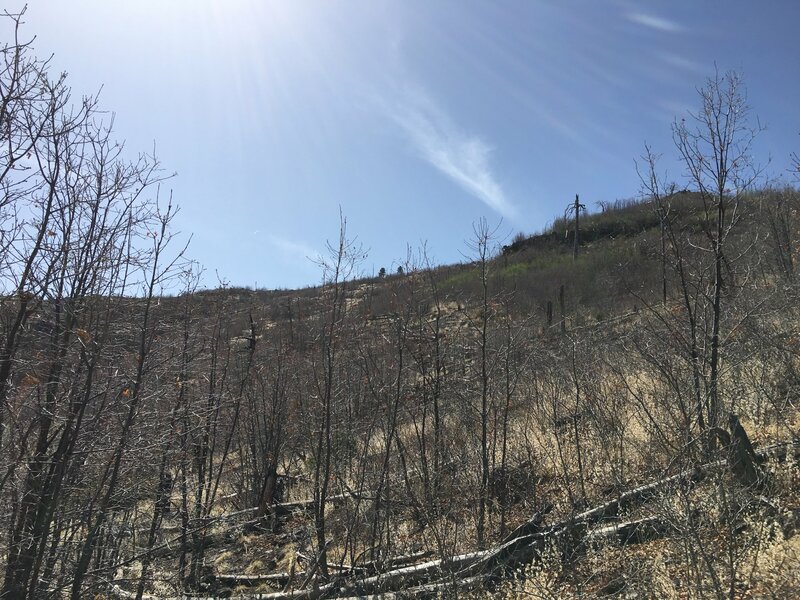 Almost exactly 2 hours into the walk, I arrived at the point where both Rankine and McEntee left the trail and headed up the side of the mountain. While McEntee had chosen the “creekbed” for his climb, Rankine more or less chose the hump of a ridge immediately west. I didn’t want to boulder-hop the drainage, I chose the Rankine path. 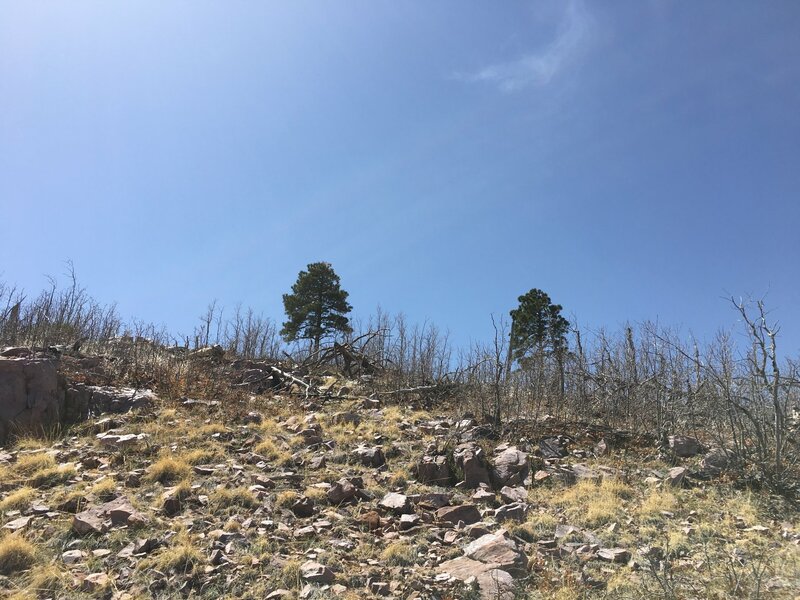 From this point, I couldn’t find so much as a goat trail while snagging myself on straggly pine-like bushes/trees, whacked in the face with branches, assaulted by thorny shrubberies, until I got about 500′ south and 200′ higher. At the above vantage point, if one looks really carefully, the cut containing the Barnhardt trail is visible far below.However, in the foreground, one can see dense copses of burned stumps and grey sticks. 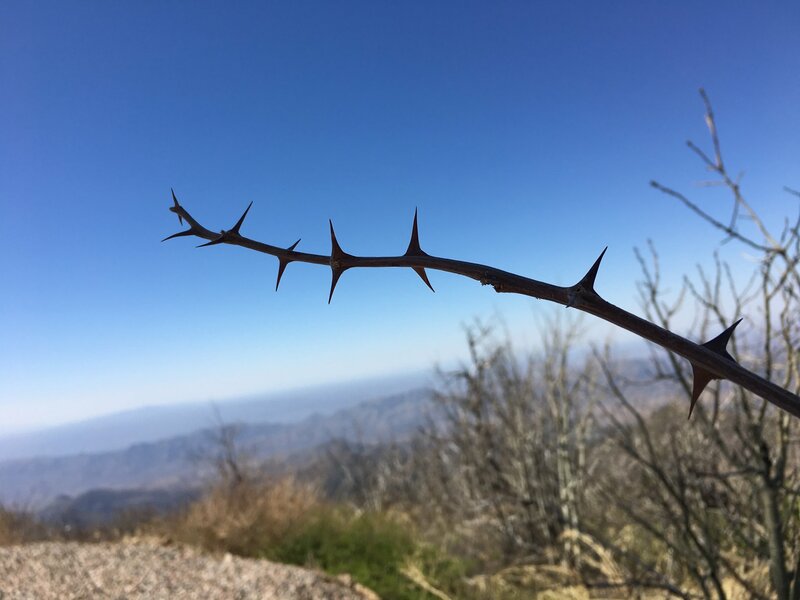 While the slope above was reasonably clear of obstacles, the nasty patchy clumps of what could charitably be described as centimetric extemely pointy thorns, supported by leafless, tall, grey-skinned branches and trunks, would prove to be painful and not without a little blood lost. Looking at the top of the ridge, a pair of pine trees was beckoning. Between me and them were hundreds of downed trees in various stages of decomposition, with unknown peril in footing. And more of the grey-skinned needle trees. Nearing the top of the ridge, the two pine trees lied to me that they were near the top of the mountain. Nearly to the pine trees, the far left distance showed what looked to be Mazatzal, but it, too, was a lie. By now, and around the 7000′ level, I was completely winded, getting a headache, and feeling a little queasy. Slowly it dawned on me that I hadn’t been above 1400′ AMSL for anything but short periods of time over the past 9 months. 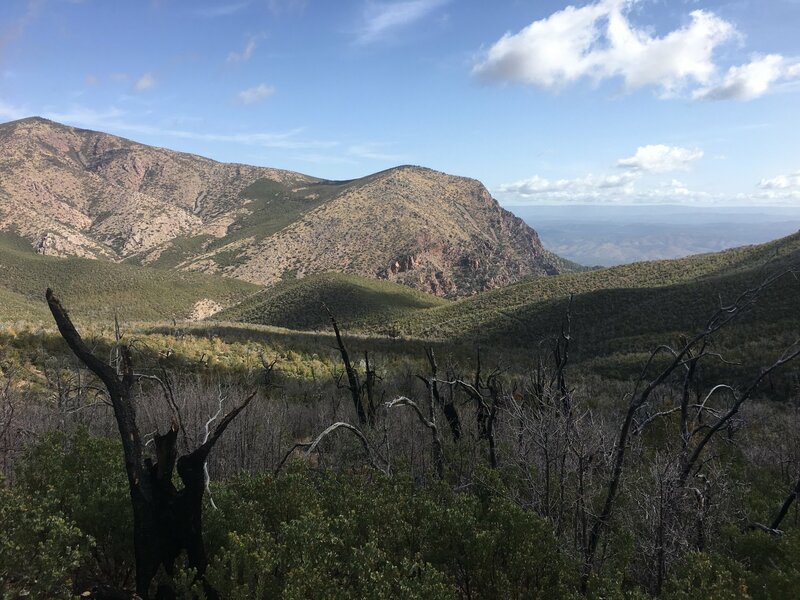 The plateau beyond the pine trees was large and pretty much covered in all sorts of prickly vegetation, manzanita groves, more of the grey-skinned stuff, cacti, or more downed trees. Picking a route through the morass was daunting. Generally, I aimed slightly west of south to pick up the line that Rankine, McEntee and Poulin had used. The good thing about that path was that it was more often on hard rock, so there was less of the nasty shrubberies. Finally, the prominence of Mazatzal was visible, What a massive pile of layered metamorphosed sedimentary rock, with red rhyolite atop, striking NNW/SSE and dipping steeply to the east. By now it was around noon, and I was really flagging. I’d stayed hydrated, ate a Stinger gel pack or a Clif bar every hour or so, but the lack of trail and the altitude had really smacked me. Finally at the summit. While only 3:28 elapsed moving time, it had taken me over 6 hours to get here. It was quite breezy, air temp in mid-60s, and all the clouds had burned away. Found the peak register. Please, the next person summiting bring a fresh notebook. McEntee improvised with a couple of scraps of cardboard, on which I added my arrival. The ammo box with peak register is about 15′ south of the benchmark itself. 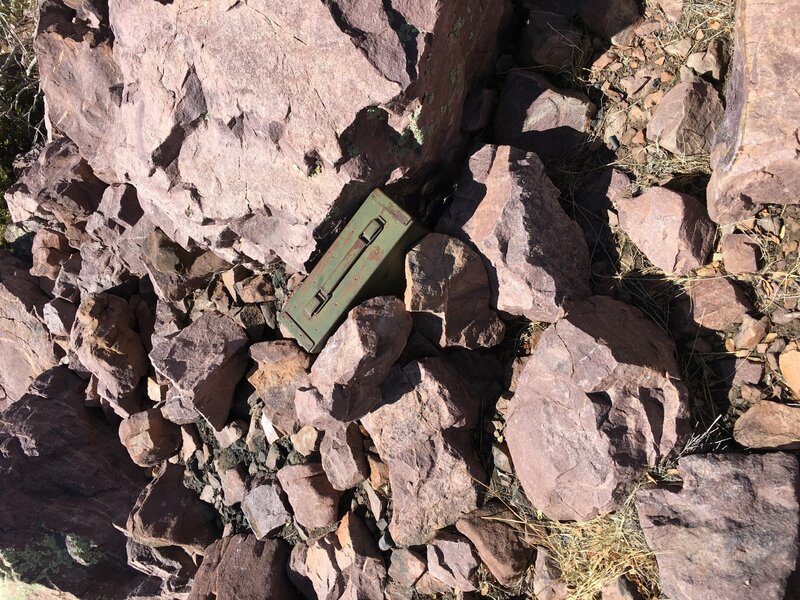 Inside the ammo can is a two-way FRS radio, some spare alkaline batteries, and a disposable lighter. Forgot to try the radio or lighter to see if either still worked. 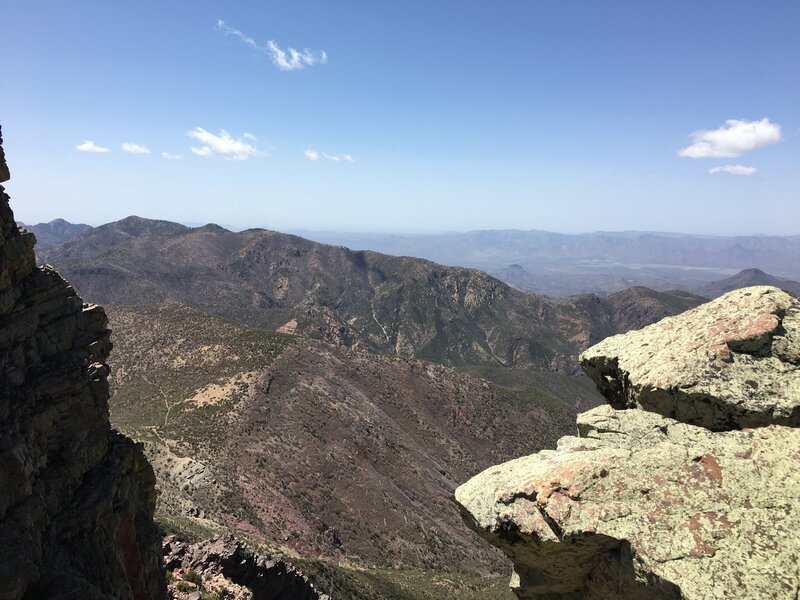 Views, as others have pointed out, are great, and even on a somewhat windy and hazy day like mine, Pinal, The Flatiron, Four Peaks, the endless Mogollon rim, and the San Franciscos were plainly visible. Two panorama views are this one generally from south through west to north, and the second completing the circle. Did not spend a lot of time atop the mountain. Already exhausted, I was glad that I’d started early, and that there were five more hours to sunset. 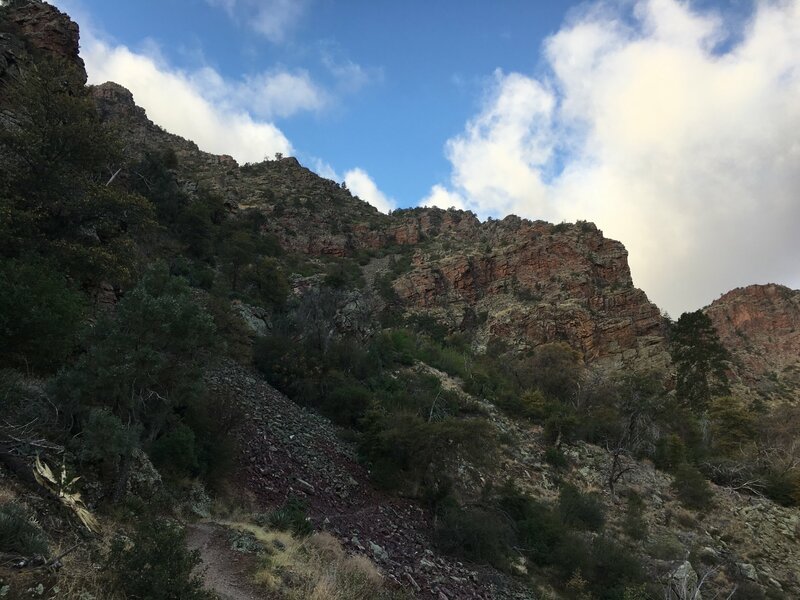 After a bit of rumination, I chose to descend via the route that Kassan had taken in his assent; it was only 4.9 miles to the trailhead via the Shake Tree trail. Jumpin’ bejeezus, the south side was tough. Manzanita forests, parsed only by repose-angle rivers of rockfall. 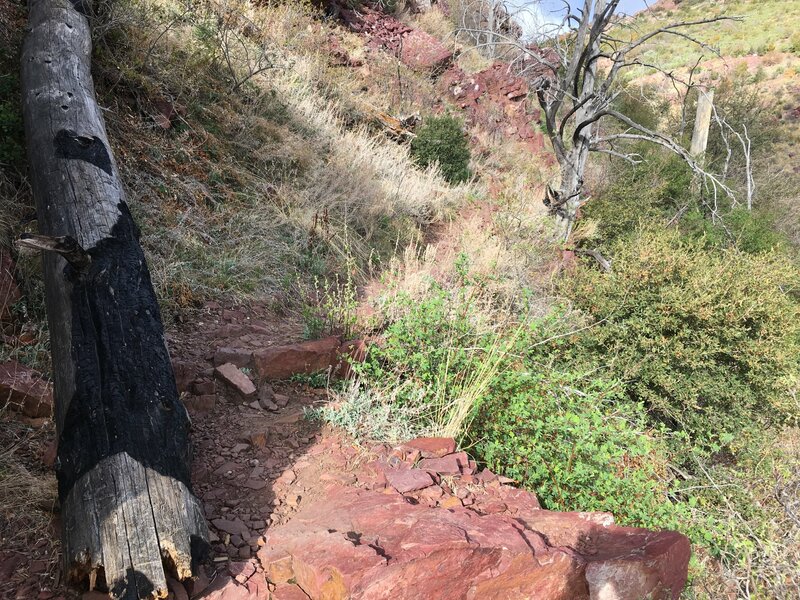 Again, from Kassan’s assent notes, cliffs were avoidable; dropping the almost 2000′ to the Shake Tree required no dangerous exposures, no more than maybe a 6′ drop or ten, and sometimes even a cairn would show up, providing tantalizing evidence that other bipeds had been there. I am really glad that I was wearing my standard hiking costume: long pants, long-sleeved shirt, and the broad-brimmed hat with neck drape. And I checked every once in a while that I could get into one of the distant amateur radio repeaters in case something bad happen. And really weirdly, the AT&T coverage remained generally ok. It took three hours to get down the 2000′. I was hammered. I was falling more than I was walking! 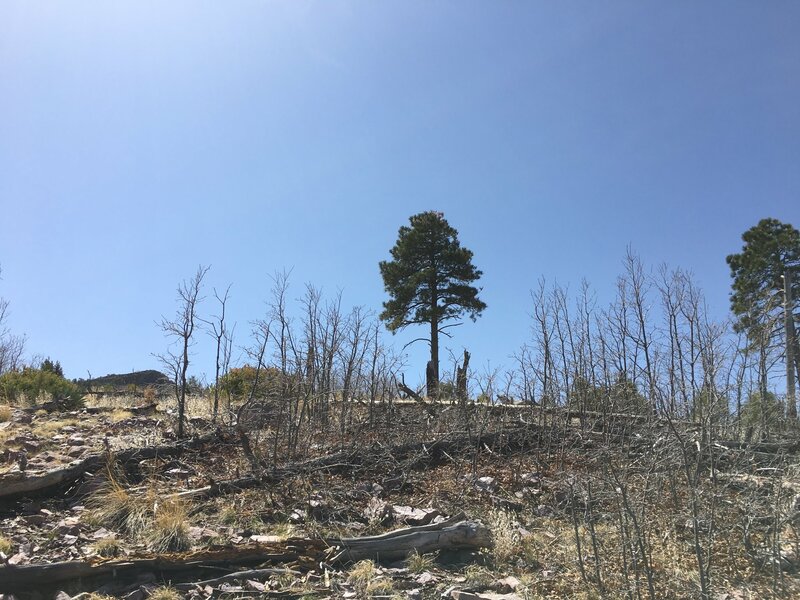 The manzanita forests were dense, with painful scrub oak undergrowth. And hidden everywhere were cacti and yucca. Oh, and it definitely looked like there was poison oak. The iPhone’s GPS didn’t have the necessary sensitivity to give me a position fix to know where I was relative to the Shake Tree, but I finally picked a wash to descend, knowing that I’d meet the trail eventually. At 1610, in the pine forest, I arrived at what appeared to be a real trail. 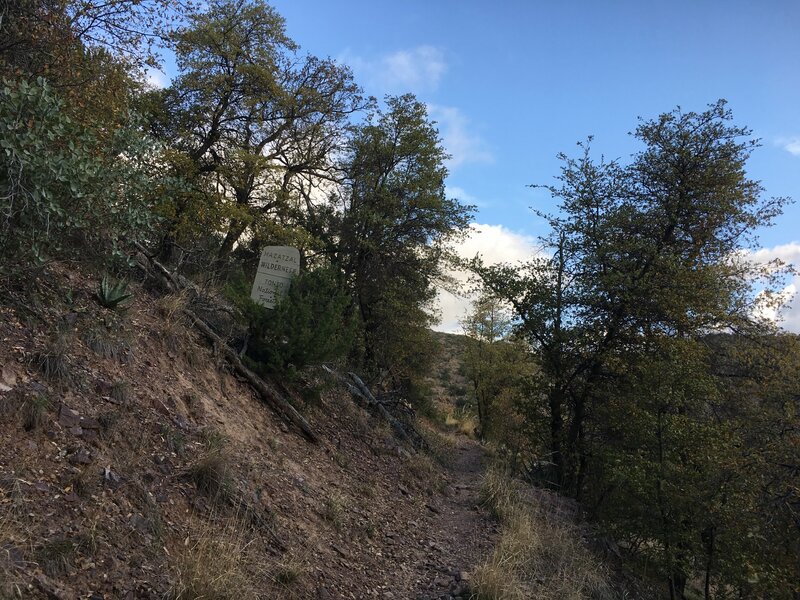 The realization that I was on the Shake Tree came, when in a dense canopied area I saw what looked to be a trail, at the right elevation, and especially because someone had left atop a big rock a large plastic bag of Spitz sunflower seeds. I dumped the seeds on the ground, for the gentle woodland creatures, and put the empty bag in my trash pocket. The rest of the return was on the Shake Tree, and while not as nice as the Barnhardt, it was way better than no trail at all. Made it back to the vehicle at 1812, for a total trip time of 11:43 and total elevation gain of 4840′. 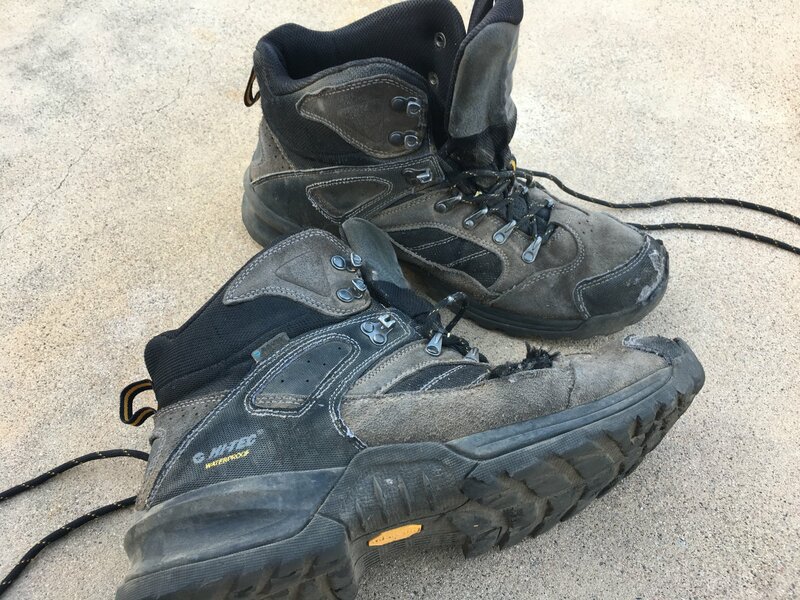 My boots finally blew out on this hike, the tread had just about gone but the outer inner cloth of the left foot, just above the leather, got shredded. 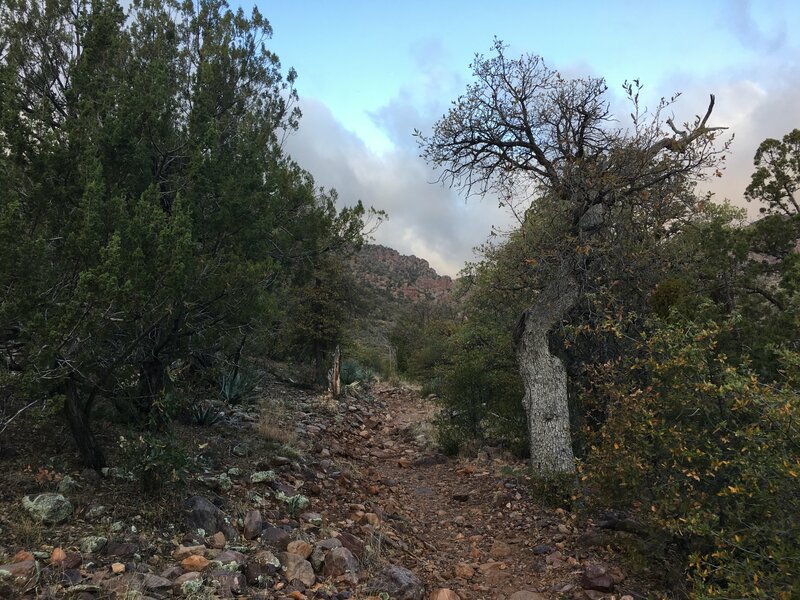 Was a combo of 150 – 200 miles on the boots over hard Arizona desert, and the manzanitas, thorns, and rocks on this trip. Have a brand new pair in the back of the truck just waiting to get dirty. While I did it, and I returned to tell the tale, this is one of those hikes that will take a while before the pain fades and instead I remember fondly.